In 2017, Manitoga’s Artist Residency program will feature a site-specific pavilion designed and built by Master of Architecture Students from The University of Pennsylvania's School of Design. The Artist Residency program was initiated in 2014 to foster creative responses to Manitoga that invoke Russel Wright's legacy of creative experimentation and celebration of place. 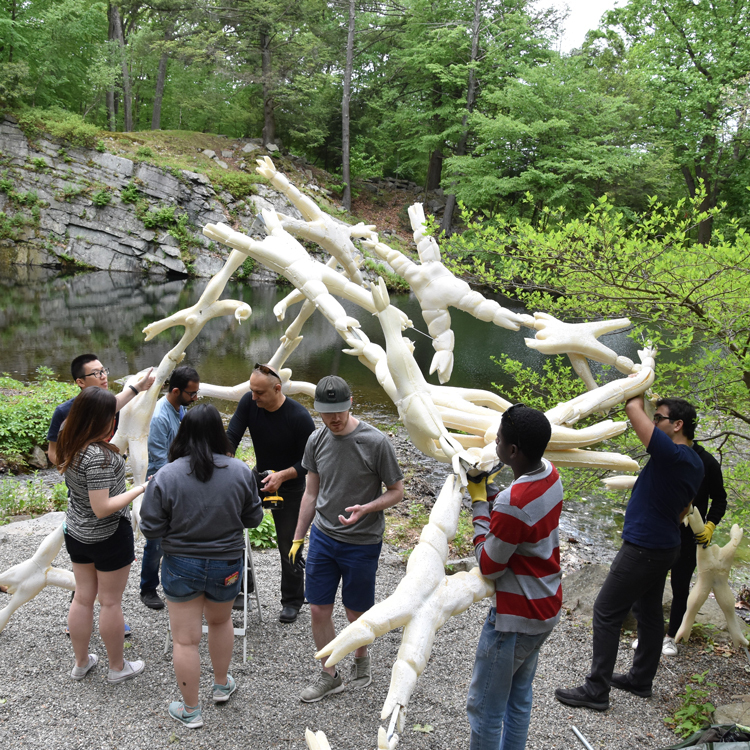 Master of Architecture Students at the University of Pennsylvania School of Design designed, built and installed a full-scale, site-specific pavilion at Manitoga inspired by Russel Wright's design legacy. "We are thrilled that Manitoga's 2017 Artist Residency Program brings together a new generation of designers with a mid-century design icon," says Executive Director Allison Cross. "In his experimental home and landscape, Wright celebrated material innovation, good design, and harmony with nature. The striking creativity shown by the student work is an inspiring tribute to his legacy." The pavilion installation will be on view during seasonal public tours and special programs. A Members Summer Celebration will be held Saturday, July 8, 4-6pm. The residency culminates a two-year collaboration between Manitoga and PennDesign's Architecture Department. 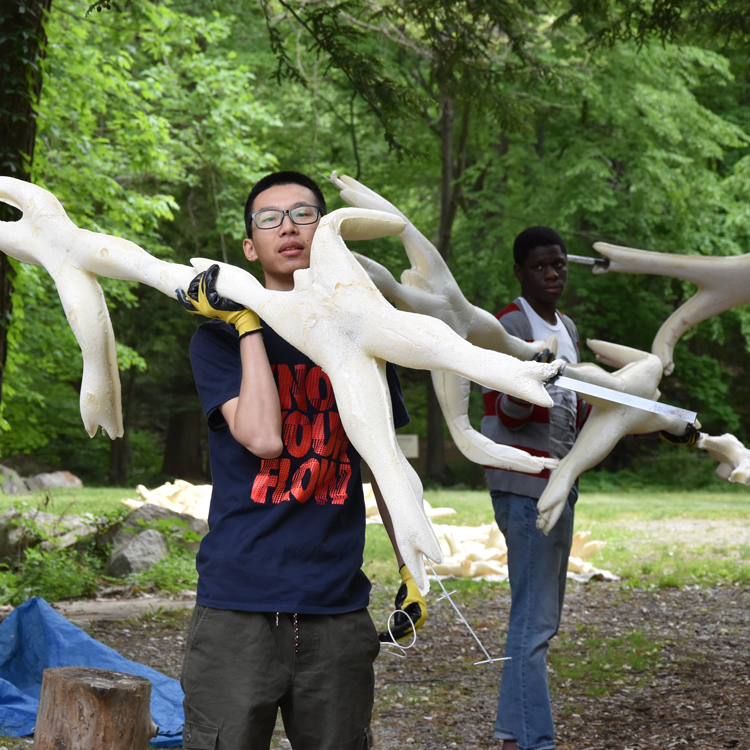 Over 150 students visited Manitoga and participated in various studio projects inspired by Wright's design principles. 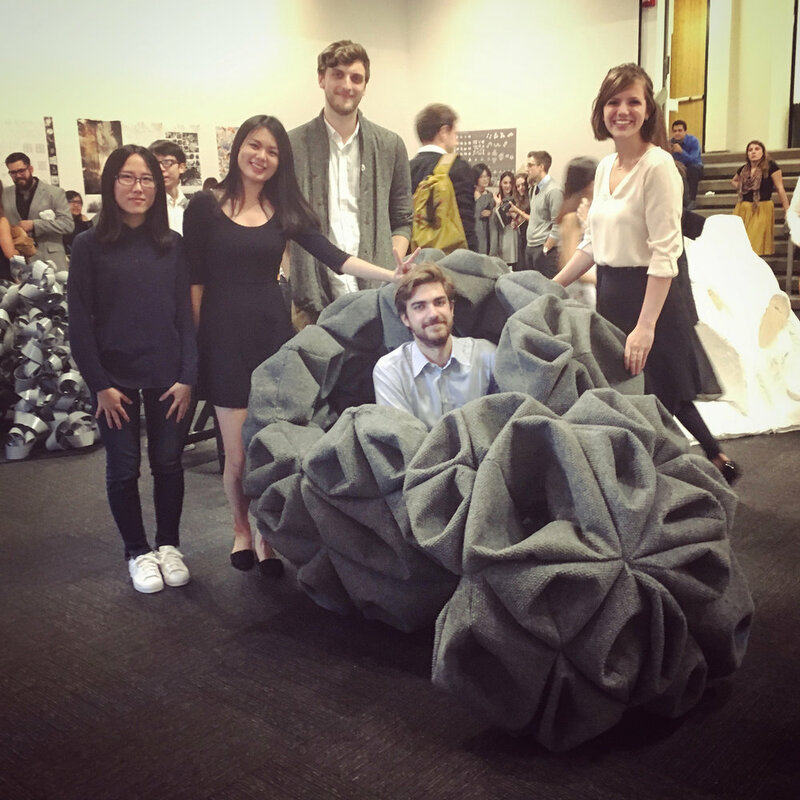 A juried competition of student group pavilion concepts was a program highlight with the 2015 winning pavilion Over Cast named one of the world's top student design-build projects by ArchDaily.com. The pavilion competition was coordinated by Associate Professor Andrew Saunders, who explains, "The design of a contemporary pavilion for the site offers a unique opportunity to extend the legacy of Wright and of Manitoga. The pavilion is meant to be a built dialogue that speculates on the trajectory of mid-century modern design of mass standardization in the context of today's digital technologies." The winning design concepts from 2016 - Hereafter and Devour(ing) the Dark - were developed by graduate students as one pavilion structure for Manitoga in the seminar Techniques, Morphology and Detailing of a Pavilion, led by Lecturer Mohamad Al Khayer, who also supervised the production and installation of the pavilion at Manitoga. Says Department Chair Winka Dubbeldam, "the pavilion installation at Manitoga is a unique design build experience. 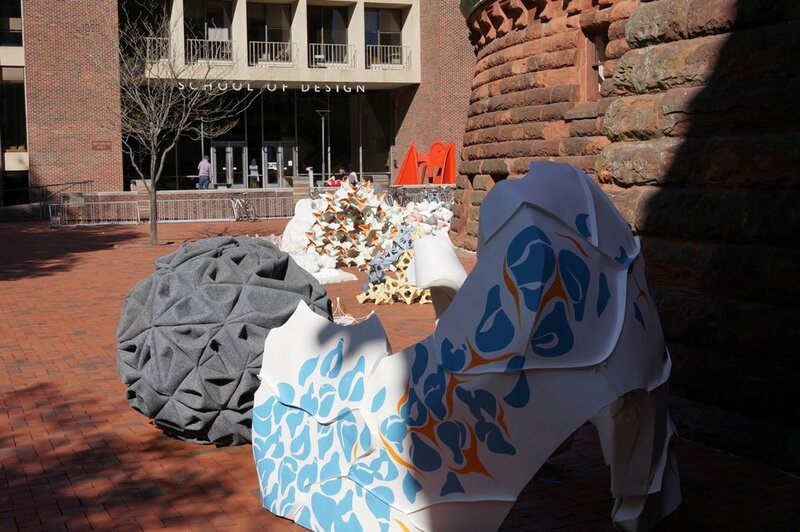 Students have the opportunity to take what they are learning at PennDesign and move it beyond our walls to engage a rich cultural context with an immediate impact." More images available in the Pavilion Project Gallery. Enrolled students: Sookwan Ahn, Zakariya Yaseen Al-Haffar, Mohamed Ali, Musab Mohammad Badahdah, Xiaonan Chen, Justine Huang, Bosung Jeon, Hewen Jiang, Yunhwan Jung, Katherine Anne Lanski, Dongliang Li, Siyang Lv, Jia Lyu, Xiaoyu Ma, Ayotunde Oreoluwa Ogunmoyero, Taeseo Park, Grace Soejanto, Ali Tabatabaie Ghomi, Lingxiao Teng, Ailin Wang, Yijia Wang, Ge Yang, Yunlong Zhang, Yuchen Zhao, Jianbo Zhong, Xieyang Zhou (Instructor: Mohamad Al Khayer). 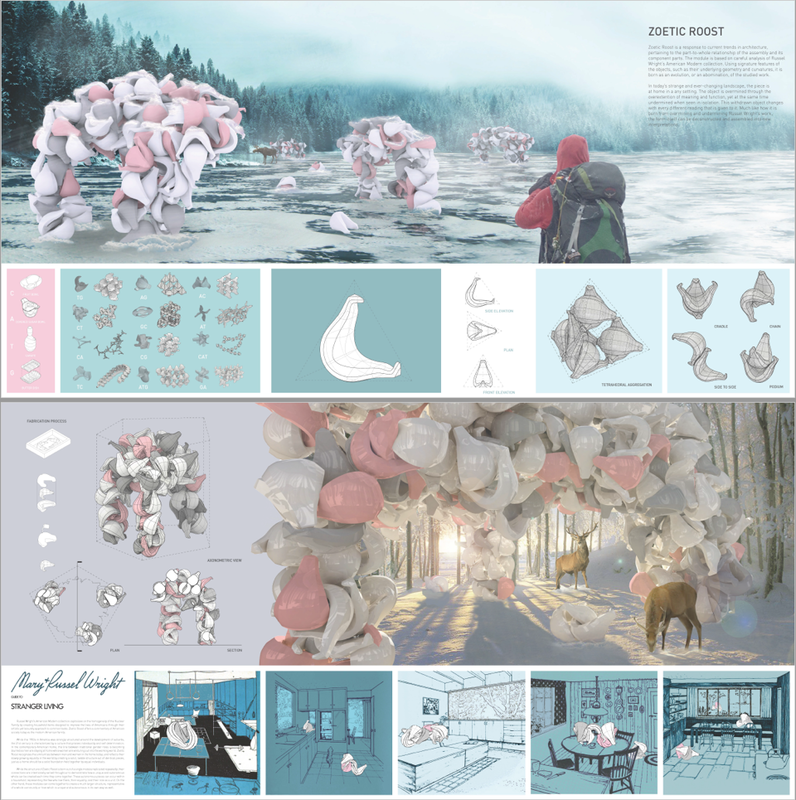 Winning Projects (2): Devour[ing] the Dark by Katherine Lanski, Justine Huang, Ayotunde Ogunmoyero, Daniel Silverman, Lingxiao Teng, and Xieyang Zhou (Instructor: Michael Loverich); and Hereafter by Grace Soejanto, Mohamed Ali, Ailin Wang (Instructor: Michael Loverich). Honorable Mentions (3): Laurentia (Best Presentation) by Dyan Castro, Yanking Huang, Dili Zha, and Yi Zhu (Instructor: Miroslava Brooks); SEEM/less (Best Craft) by Elizabeth Heldridge, Logan Weaver, Nikolaos Kalantzopoulos, Yitian Zheng, and Xiaoyu Duan (Instructor: Miroslava Brooks); and Zoetic Roost (Best Technical Innovation) by Ariel Cooke-Zamora, Jordan Hillier, Gwan Sook Kim, Tae Hyung Lee (Instructor: Andrew Saunders). 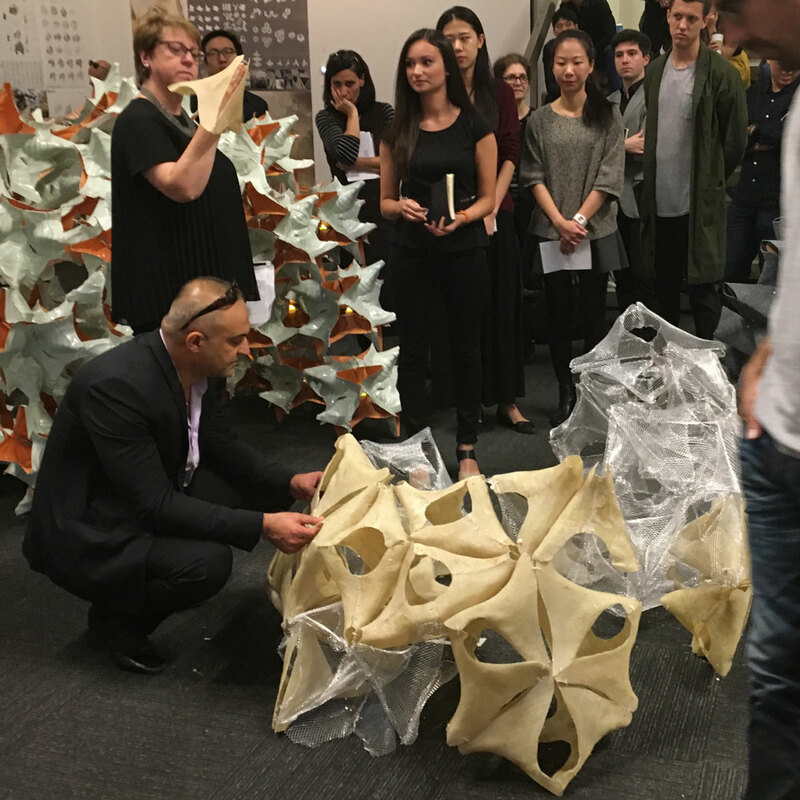 Photos: Top - Bottom: Pavilion models at half scale, Meyerson Plaza, University of Pennsylvania; Competition Jury Members and Students; Laurentia (Best Presentation); Model of Hereafter (an Overall Winner); Model of SEEM/less (Best Craft) with students. All images courtesy PennDesign.